For 26 years more than 150 artists living in a beautiful, spacious development south of Santa Fe have opened their home studio doors for an annual tour. On May 20 and 21 resident artists of Eldorado show off their talent and wide spectrum of media, which include: ceramics, digital art, drawing/printmaking/paper, fiber art, glass, jewelry, mixed media, painting, photography, recycled art, sculpture, wearable art and wood. The Preview Gallery kicks off the Tour on Friday, May 19 at 16 Avenida Torreon in Eldorado from 5-7 p.m. with an opening reception. You can meet and talk with the artists, ask them questions about their inspirations, immerse yourself in their work and enjoy music and light refreshments. 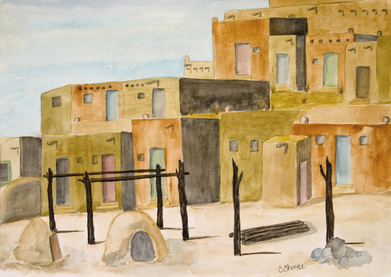 The Eldorado Studio Tour is one of the largest group shows in New Mexico, which provides a unique opportunity to see and buy the work of numerous artists in a single venue. Susan Orth has been a Gold Sponsor of her longtime friend and Eldorado Tour participant Cynde Christie for many years. Christie says, “As far back as I can remember, I was creating something…art, food, mud pies, whatever. I just had to make something that I thought was beautiful out of whatever was around me. Eldorado's attractive physical setting, large areas of protected open space, protective covenants, excellent elementary school and convenience to Santa Fe have made it a popular place to live in the Santa Fe area. Please see our April 11, 2017 blog about Eldorado to learn more and visit the following websites to learn more about the fantastic tour this month. And as always, if you come for a visit, don’t hesitate to contact us to preview homes in Eldorado or the Santa Fe area!